30 degrees Celsius in there, with my glasses steaming up as I go in. 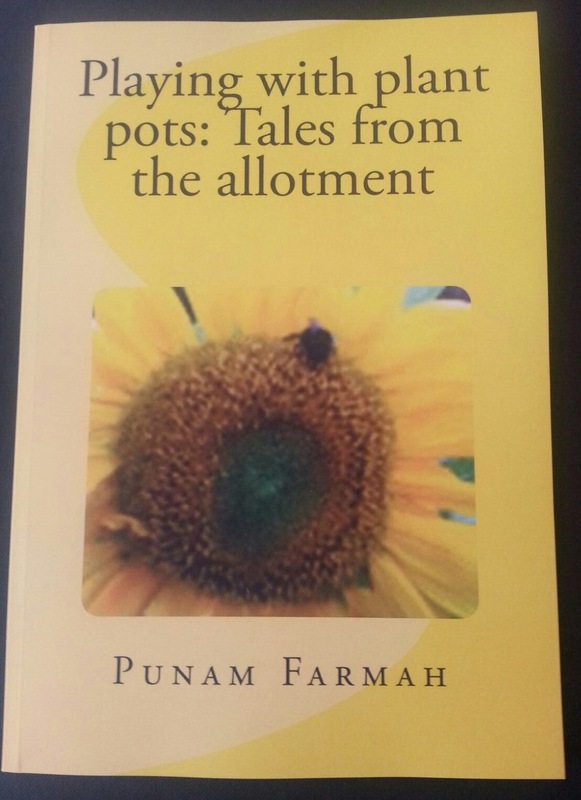 The next task was to pot up tomatoes. These were starting to become tall and gangly beyond their baby leaves. Some of their foliage is now quite frilly. Taking a quick look at the peppers and aubergines. Had to some emergency potting up these week, with both of them as they have an accelerated growth spurt with the spring sunshine. There are quite a few aubergines, I know. Mama h quite likes them, so it will be interesting to see if they fruit. 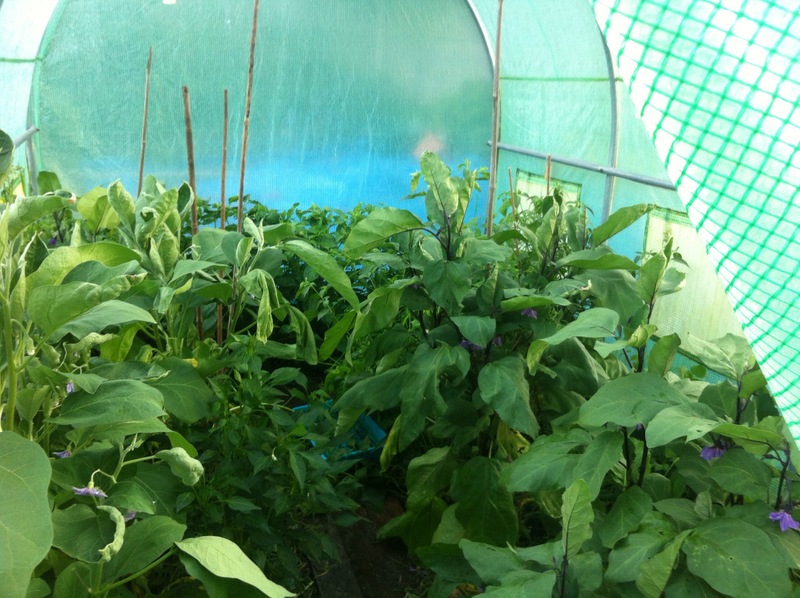 All being well, chillies and bells will be in the poly tunnel. Dorset and bengle nagas are small, but growing. 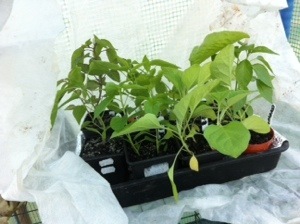 Pretty purple rainbow chilli is romping ahead with its purple tinged leaves, with early jalepeno hot on its heels. The last few days has seen mild spring like weather. 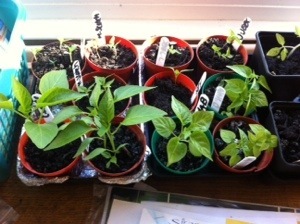 Weather that window sill babies have been basking in; least of all the chillies. 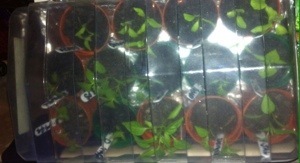 I am growing the chillies from cold, I am not using grow lights or heated mats. This means that the chillies are perhaps a little smaller, and their growth rate is little below than those with grown with sophisticated equipment. So one has a bit of capsicum envy. See I know full well that at this time of the year, chillies will be diminutive. A couple more weeks, and they will start to pick up and plume. That does feel a little like a distant memory, and it’s quite a leap to fully fledged, foliaged plants ready to be transplanted to the poly. 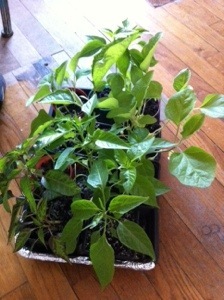 Whilst the sun is out, the chilies are loosely lidded with a prop cover. They are sat on reflective aluminium foil to help absorb some heat and light to keep the plants from getting too cold at night and then keel over. With the second Superhots are sunk, I would like to be optimistic. However I’ve been told that Jamaican jerk is very difficult! Have realised that the windowsill babies are getting on a bit. Some of the seedlings have started to grow past their baby leaves, albeit a little slowly. The aubergines have been growing quite quickly compared to the chillies. Thought I might as well pot everything on. Seedlings are still a little small; but it is still very early. Perhaps won’t have more accelerated growth til later. I have for the moment removed the foodbag cloches. Just hope things don’t got pair shaped! Finally, the cover for the 4TB has arrived. A little bigger than expected, but that is a lot better than smaller. I had purchased one that did turn out to be smaller, and of no use. This may be bigger, but it is also made of the same reinforced material as the wendy house and the poly tunnel. I am hoping, therein, that it lasts a while. 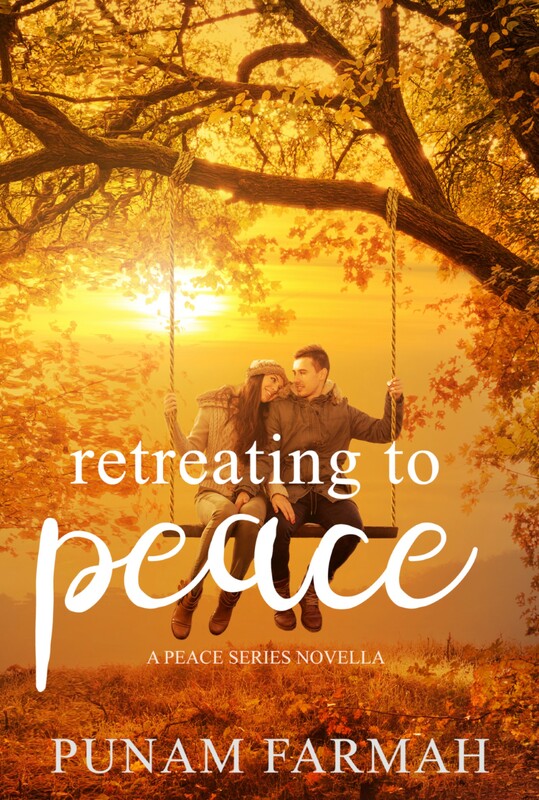 That said, the cover that was replaced is in fact five years old. Apparently, the shop that made the 4TB has changed the dimensions, so I couldn’t an appropriate replacement. That said, to their credit, the company was very good about making amends. In the poly tunnel yesterday, it was a rather balmy twenty degrees. The best thing, that it was still there, and hadn’t floated off. The wendy house was there also, for which we are also thankful. The lyon prizewinner leeks are still there and quite snug too. Tomatoes aren’t doing too badly at the moment. The vast majority of the seeds that were modularised have come through. The module was sat on the not very warm window sill, and so they did take their time. 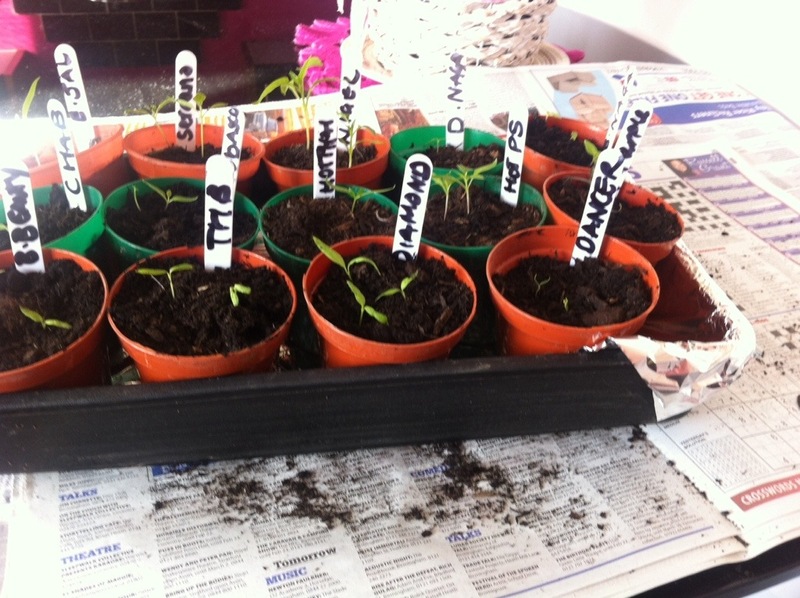 The babies were also a little leggy, which resulted in them having to be demodularised and then potted up. No mean feat, as I am not very good at pricking out and potting up. 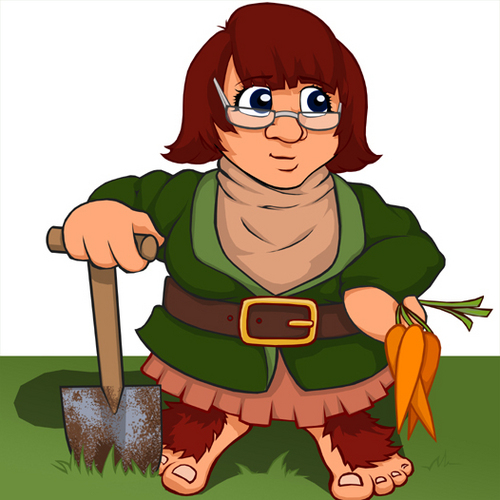 Which is why, I only sank singular seeds to begin with. 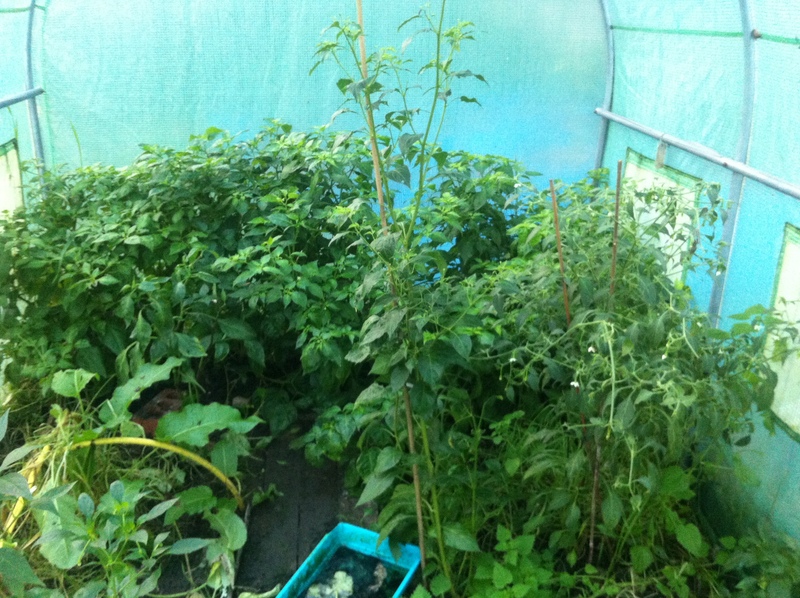 In essence, at the moment, we have the same number of tomato plants as we did last year. It remains to be seen, if these will all achieve maturity. On the next window sill, we have the the aubergines. Dancer, diamond, tres hative de barbentane and black beauty have all come through. I am still waiting for early long purple to germinate. There was a pleasant surprise in how quickly the aubergine seeds have come up. Of the chillies and superhots, I have yet to see any of yellow scotch bonnet and orange habanero. Fire has been temporarily written off in failing to come off entirely. The dorset naga looked a bit precarious, having caught a cold; it looked as though it was going to keel over. I checked this afternoon, and it did appear to have rallied. I’m not hedging my bets. I would like it to survive, one has a dorset naga chilli challenge to try! Have resown some california wonder, as i had somewhat neglected to re-sow a sweet pepper. All those hot chillies, and no sweetness. One is thinking of all the possible chilli jam to be made. I have kept all the babies in foodbag cloches. Mainly, as they are on window sills that don’t always stay warm. With some heat and light trapped, the cloche offers something of a security blanket. I am conscious that a sudden drop in temperature could wipe everything out. I would like to place the tomato babies in the 4TB, under a fleece. Just not sure if they would survive, would be a tragedy for them to be annihilated after being pampered for so long. 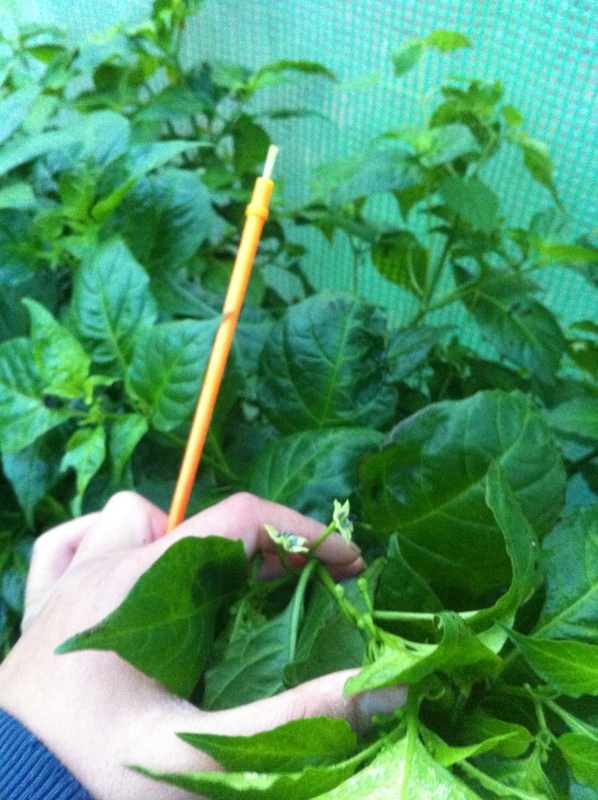 Chillies and bell peppers are known to have a rather long time in growing and cropping. So there are those who believe that the earlier the seeds are sown, the greater the chance of a bigger bounty. That is if you can get the seedlings to germinate within the confines of a heated propagator. In the past, I have used my heated prop, and seeds have indeed cracked and germinated. However, these babies have soon keeled over with a lack of heat and light. Perhaps my own naivete too. There has been far greater success not using a heated magic seed growing box. So I am taking this route, even for early experimental chillies. This year, I made two sowings. The first was in January, and these did keel over for want of a warm hug. A A few of these were rescued, and sat next to a second sowing made in February. Without a heated prop. And nestled amongst white paper, as I thought this might act as a heat trap. When all it did was reflect the heat up through the bottom of the yoghurt pots. Useful, when chillies require bottom heat to crack the seed. At least that was my logic…that the heat would be trapped in the box and help keep them warm. Anyway, post Christmas, early sowing of chillies. I have done this before, a boxing day sowing. If only I knew then, what I know now. Perhaps they would have survived. With the exception of the early jalapeño, six seeds of each have been sown into yoghurt pots. So each yoghurt pot, has been filled with dampish soil and three seeds each in a triangle. Each pot has then been encased within a foodbag, sealed and labelled with the name of the variety. Positioned then onto a warm window sill. There is a distinct lack of warm window sills in the absence of a classroom as used previously. There is little guarantee that any of these actually germinate. 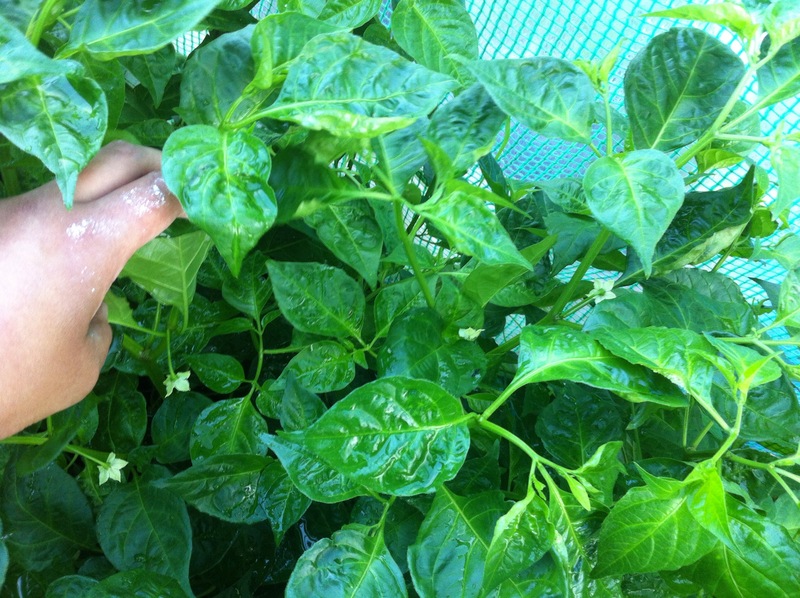 Chilli seeds are notoriously stubborn, and will generally require a heated propogater. It could therefore be, that my previous good fortune has been nothing but fluke. I have deliberately chosen the varieties sown. In that this year, these were actually quite successful, and having an early jump on the growing could be potentially beneficial. The Pretty purple rainbow chilli, early jalepeno would have to be the biggest surprises, and were the second sowing in Feb. A point to note, was the hot patio sizzle. This particular variety did take it’s time. A later fruiter, in that it was easily August before it fruited, and then it was fruiting abundantly September when many of it’s poly tunnel comrades were ready to give up the ghost. In addition, I had plucked some of the the fruits off in the their pale yellow phase, and on putting them in ma’s kitchen in a glass bowl; observed them starting to change colour. Though they had actually just started to turn on the plant. Below, you have green nigel outdoor chilli and the lovely pretty purple rainbow chillies. It was only later, when these had been moved back into my classroom, that the rainbow bit actually happened. And the jalepenos found themselves in a bit of a jam. So there are high hopes for these seeds sown to day. And the slim possibility that they will then go on to reside in the poly tunnel. The next plan, is to sow superhots, namely the dorset naga and a few habeneros in late January early February.